North Korea is very much in the news at the moment. Its “sabre rattling” claims that it is both capable and ready to launch a nuclear attack on the United States of America have caught the headlines everywhere. Although North Korea is well known for its over-blown, self-aggrandising pronouncements, this current and sustained level of bellicose rhetoric is in some senses unprecedented. It has undoubtedly increased tensions in the region. Yet, it is also extremely odd, given that only a few weeks ago the world was a baffled witness to the equally unprecedented pictures of North Korea’s new leader, Kim Jong-un, on our TV screens officially entertaining a famous, retired American professional basketball player. It’s quite likely that this present display of political posturing is purely attributable to the heightened paranoid insecurity of Kim Jong-un’s regime in response to this year’s joint military manoeuvres by the US and South Korean Military Forces (arguably “sabre rattling” of its own sort). Kim Jong-un is thought to be only 29 or 30 years old, and was entirely unknown before his father’s death in December 2011, hence it is perhaps understandable then that the North Korean regime might be feeling somewhat more vulnerable during these annual allied military manoeuvres than in previous years. I sincerely hope that it is simply bluster and hot air which will blow over by the end of this month when the joint military manoeuvres draw to a close. However, I quite understand the level of uncertainty that this kind of rhetoric causes in the region. Three years ago I was staying in Seoul, having arrived only a few days after the sinking of the South Korean warship, Cheonan. Each morning I’d watch the TV news reports and scan the Korean English newspapers for the latest updates as the rescue efforts were given up and the salvage operations began. A memorial site was set up not far from my hotel for the grieving families and general public to commemorate the 46 sailors who tragically lost their lives in the sinking incident. The subsequent investigation has claimed that the cause of the sinking was most likely the “bubble jet” effect of a torpedo being detonated close to, but not in direct contact with, the hull of the warship. The investigation, contested by some nations and supported by others, implicated the North Korean side. The incident very much remains a subject and spur for debate. I’ve also experienced the palpably heightened tensions caused by North Korean missile tests in the immediate region surrounding the Korean peninsula. I was in Tokyo on several of the dates when the North Koreans tested long range missiles that threatened Japanese airspace. North Korea’s volatile rhetoric, along with its seemingly provocative demonstrations of its advancing technological capabilities, coupled with its intense secrecy and isolation quite understandably are viewed very differently in Asia to the way it is popularly seen in parts of the globe which are further away. North Korea is arguably taken less seriously in some parts of the world for almost all the same reasons that it distinctly unnerves its neighbours. It’s seen by the West as an oddball, impoverished Totalitarian state. A fanatical, brainwashed nation presided over by a bizarre quasi-royal dynasty of hereditary “communist-socialist” dictators. The contradictions seem both laughable and frightening. News reports from North Korea itself are often akin to witnessing a ludicrous yet chilling pantomime. During my stay in Seoul in 2010 I decided it was time to see this political-military stand-off for myself, to learn more and try to understand the situation by visiting the De-Militarised Zone, or the “DMZ.” I had heard much about the current situation from my Korean friends, many of whom have taken their turn stationed on the DMZ as part of their national service in the military. A nation divided is a complex paradox – where defender and enemy are essentially one and the same people. Families were split by the Korean War (1950-1953), and though their ties were severed, their deep bonds were not. Enmity and empathy both still run deep. The DMZ has become a symbol of these contradictions, much as the Berlin Wall was to a divided Germany during the Cold War. But Korea’s Cold War continues. 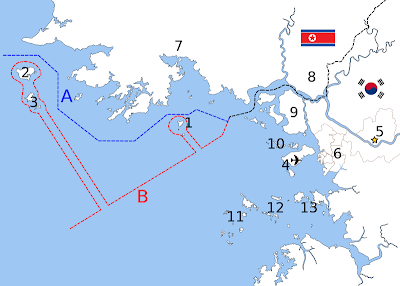 The armistice of 1953 which ended the fighting was never signed by the South Korean side, and so, technically, the two halves of the peninsula remain at war. 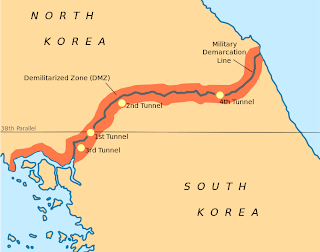 Skirmishes and incursions occasionally occur along the line of the 38th Parallel, the DMZ is a place where there is an ever clear and present danger. Whilst the South Koreans allow tourist buses to enter the zone and tour some of the UN conference facilities in the Joint Security Area as well as various observation posts, all visitors are first made to sign waivers of liability – in effect taking their lives in their own hands. I signed such a form when I boarded my bus. From there on, if I got shot – well, that was entirely my own risk. Perhaps because the Cheonan was still in the process of being raised our tour guides were overly insistent on us not taking too many photographs. Photography is expressly forbidden whilst on the bus and also in some parts of the locations we visited within the DMZ. In some respects I was rather overawed by the experience; such that I rather forgot having my camera with me in my fascination simply to see and better comprehend the place. The DMZ is vast. 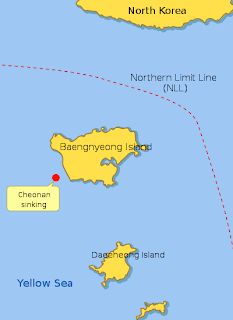 It is a strip of “no man’s land” some 4 kilometres wide which follows an S-shaped curve from one coastline of the Korean peninsula to the other. The name “De-Militarised” Zone somewhat belies the reality, for this is in fact the most heavily militarised and fortified single point on the planet. As our bus motored through it, looking out the windows I saw signs punctuating either side of the road, warning of landmines everywhere. Besides the barbed wire and concealed ordnance, the strip of land has become an unlikely haven for wildlife. 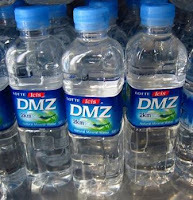 And in recent years the South Korean side has permitted the tapping of mineral water springs within the zone. 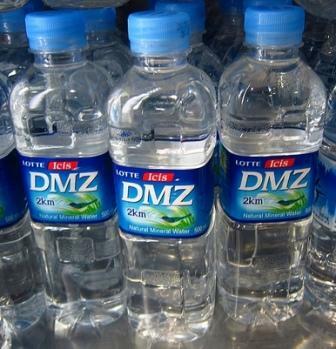 Bottles of DMZ water can be found on sale in most Korean convenience stores (and it tastes very good indeed!). When the DMZ was first set up most of the settlements within were naturally abandoned, however, there is one village which is still inhabited. Heavily supported by the South Korean Government, the village of Daeseong-dong is home to a small community of farmers, all of whom must be back within the village by 22:00hrs each evening. A similar settlement called Kijong-dong, likewise built for propaganda purposes, but left empty, stands on the North Korean side. Most of the places visited on our tour, despite the bustling parties of visitors, have a strange empty feeling attached to them. The first, being a rusty bullet riddled steam locomotive, now preserved as a monument, stands by the restored railway line. I watched as an empty train rattled back across the water, heading south from the last railway station between South Korea and Pyongyang some 205 kilometres to the north. Seoul is a mere 56 kilometres in the opposite direction. The capital cities of the two Koreas, one rather symbolically distant and unreachable, the other a mere stone’s throw away from this strangely scarred landscape – the geographical embodiment of a long standing political point of contention, where two ideologies meet at loggerheads. Much of the rhetoric touted on the southern side revolves around the themes of freedomand calls for unity and peace – but the readiness is clearly entirely geared up for the opposite. The soldiers with their heavy rifles and combat fatigues all seemed very young, but unlike soldiers in other – less contentious – parts of the world, they seemed quite open and friendly in their fresh faced way. The lad who boarded our bus to check our passports, heavily armed yet bespectacled and wearing a uniform which appeared almost too big for him, seemed more like he was fresh out of the high school chess club. After the sadness of the steam locomotive memorial and the forlorn, empty yet ultra-modern Dorasan Railway Station, we were taken to the third infiltration tunnel. This is the third and largest of four tunnels dug by the North Korean Military which have been discovered since 1974. It measures 2 metres wide and 2 metres high, set 73 metres below ground and roughly 1.6 kilometres long. The South Korean side dug its own tunnel to intercept it, down which my tour group descended, all wearing our hard hats. In their retreat the North Koreans apparently daubed the walls with coal dust in an effort to conceal its intended purpose – there are no natural coal seams in this particular area’s local geology. Cold, dank and dripping with water the tunnel is a strangely eerie experience to walk along and explore. The tunnel is now barricaded at the mid-section of the DMZ, but it's still possible to peer beyond this point into the literal and metaphorical darkness of the unknown. It is believed that there must be other tunnels as yet undiscovered. In the course of my various trips to South Korea since 2005, more so than the stories of North Korean defectors, I’ve been fascinated by the occasional brief reports in Korean newspapers which claim evidence of North Korean spies and reconnaissance parties infiltrating the South, either utilising tunnels or small submersibles, sometimes becoming stranded and so committing suicide rather than surrendering. The last place on my tour was Dora Observatory, built in 1986, it gave the clearest view into distant North Korea. From here you can see the famous flagpoles duelling for supremacy in height, as well as the heavily fortified stretch of the Military Demarcation Line. Even squinting through binoculars, beyond the DMZ there is little of much remark to see. Just hills and trees, a few buildings, all tiny in the distance – much like the landscape and scenery behind you. But what is different of course is the conception. You are looking at a place which you are not permitted to venture into, and, if you did manage to venture across, you would find yourself in a decidedly strange and unfathomably different social order. It’s perhaps that sense of the unknown and the perhaps unknowablewhich, in essence, I think, keeps the fear and the fascination for North Korea in our daily headlines. You can’t help staring across that line, and wondering: “What if I’d been born over thereinstead of here?” … What must it be like over there, being born, growing up, and living in such a place – isolated from the rest of the global community? It made me think of a night view of the Korean peninsula which I’d seen, taken from a satellite, the lights of the towns, cities and roads glow warmly in China and South Korea – but the space between these two nations is as dark as the seas on either side. North Korea is a blank not simply on the map alone. North Korea is everything we simply do not understand. I hope one day the two Koreas will be reunited. It will undoubtedly be a complex and painful procedure. But, when it eventually happens, I hope the process which results in such a reunification will be a peaceful and harmonious one.